The Floyd’s Triangle is a right angled triangle with array of natural numbers. In this article we will show you, How to write a C Program to Print Floyd’s Triangle with example. This C program allows the user to enter the maximum number of rows he/she want to print as Floyd’s triangle. We are going to print the Floyd’s triangle of integers until it reaches the user specified rows. Following statements will allow the User to enter the range or maximum Number of rows he/she want to print. The j value will be 2 and the condition (2 <= 1) is False so it will exit from the second loop. Next, j value will also be incremented by 1. The value of j is 2 and the condition (2 <= 2) is True. So, it will start executing the statements inside the loop. It means, 3 will be printed. The j value will be 3 and the condition (3 <= 2) is False so it will exit from the second loop. This will happen until it reaches to 5 and after that both the Inner Loop and Outer loop will be terminated. 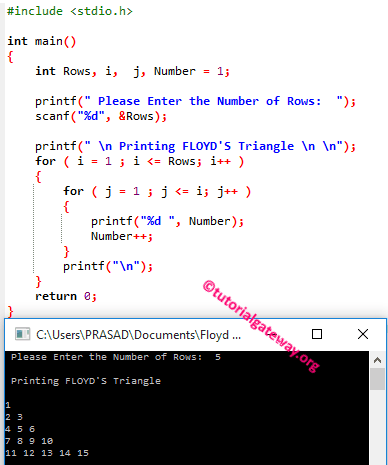 This program allows the user to enter the number of rows he/she want to print as Floyd’s triangle. In this example we are going to print the Floyd’s triangle using the * symbol. this program can also be said as printing Right angled triangle with * symbol’s.